This is an important page for managing your proposals. There are several built-in features that make it easier and faster to stay organized. The pie graph allows you to get a glimpse of your overall record of won/lost/pending proposals within a determined range of time. You can change the date range by changing the dates in the "from" and "to" fields, and clicking on the "update" button. 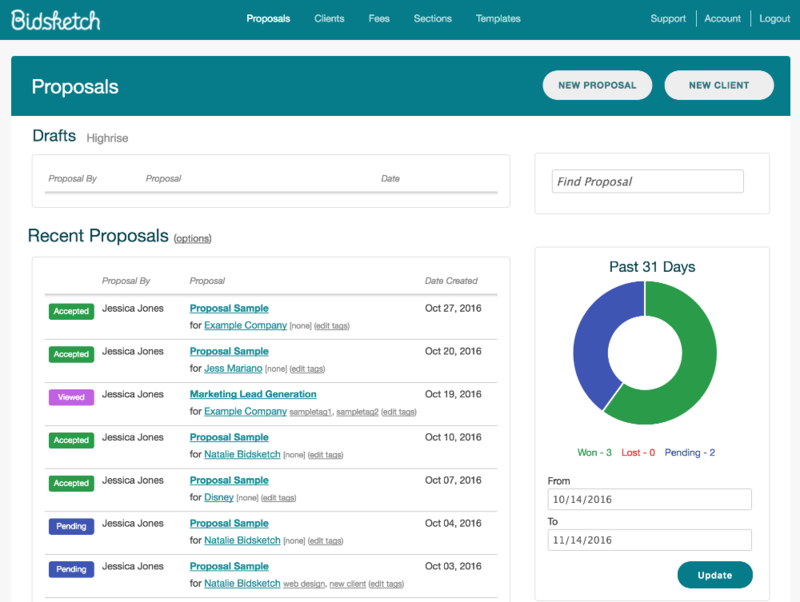 The Proposals dashboard has a lot of information. Sometimes you just want to see one specific proposal without having to sift through the list. Fortunately, the dashboard features a search function that allows you to do just that. When you're in the Proposal Dashboard, the search bar appears in the top right corner, and says “Find Proposal." 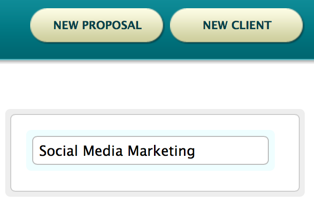 Type a keyword, client name, or tag that's associated with the proposal you're looking for and hit enter. All results that match your query should be there, without the rest. This makes it much easier to locate things in a timely manner. In your Proposals Dashboard, next to Recent Proposals, there is a link that says, “options." If you click the link, a menu pops down that allows you to conveniently filter your proposal list. This allows you to get a quick snapshot of your proposals, as you want to see them. Tags are a great way to mark and organize your proposals. They make it easy to locate specific information within seconds. The search function allows you to search tags, so you can group proposals together however you want to. You can add a tag to any proposal. When you're in the Proposal Detail page (which you can access by clicking on the title of the proposal), there is a box on the right side of the page that says, “tags." Any tags you have assigned to that proposal will show up in the box. If you haven't assigned any yet, you can do so by clicking the “update" link. Just type in as many tags as you wish, separated by commas, and click “submit." Now those tags are associated with that proposal and are fully searchable. You can also delete tags by simply highlighting and deleting. Viewing client activity can give you valuable insight into the process of proposal evaluation from the client's end. For example, if the client opens your proposal for ten seconds but doesn't download it or look at it again it's pretty safe to say they didn't do much more than briefly skim it. You can see the client's activity by clicking on the title of the proposal, then clicking on the link that says, “view client activity." Oftentimes the sections in a proposal overlap for different clients. This is one reason it's useful to have reusable sections, preventing you from having to start from scratch each time you want to outline a proposal item. But even then, many businesses have clients with similar needs, that only differ in price point or nuance. For this there is an easier way to replicate information. You can copy an entire proposal, edit it as needed, then send the new proposal to a different client. 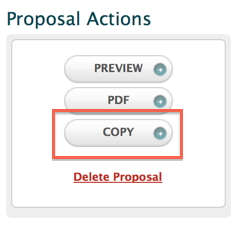 You can copy a proposal by clicking on the title of the proposal you want to copy from, then under “proposal actions", clicking the “copy" button. This will prompt you to enter the information for the new client you want to send it to, as well as a new (or recycled) title. Once you've done this, you now have a replicate of that proposal. From this point you can treat it as you would any other new proposal. You can edit each section by clicking on the “edit" link next to Opening Sections, Fees, or Closing Sections. Once you're in the edit menu you can either move sections around, or add/remove them. You can also edit/add/remove information to specific sections/fees. As soon as you click the “done" button, your new proposal is ready to send.